Sisi from Color4Nails had sent me their exclusive duo by CupCake Polishes and the minute I opened the package I knew I would love them. I never owned any CupCake Polishes before so I was really excited to try them and they were beyond gorgeous. Similar to Orly's Mirrorball, both polishes have a strong linear holo and tons of holo micro glitters that are super smooth on the nail. Umm... what are words....? So PRETTY!! 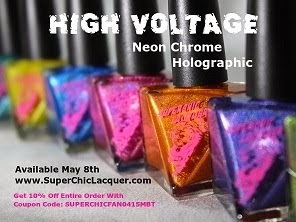 These are only available through Color4Nails so make sure you guys check them out for this duo and tons of other indies and nail polish brands.